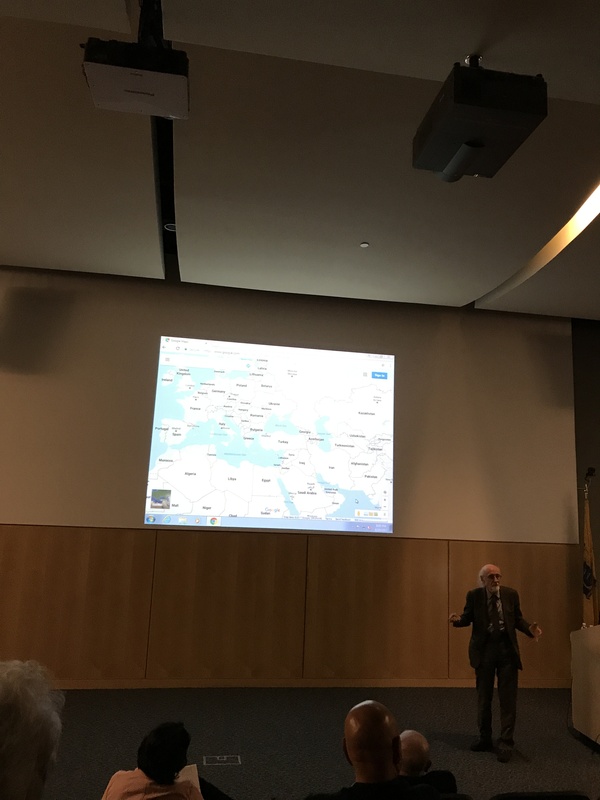 BLACKWOOD – An anthropology professor told a group of 30 people at Camden County College on April 19 about the influence the Middle East has had on international trade and religion. Dr. Brian Spooner of the University of Pennsylvania spoke in one of five lectures at Camden County College about different parts of the Middle East. This talk was about Iraq, Syria, Afghanistan and the countries surrounding them. The premise of the talk was the changes in the Middle East. “Change is something that most of the time whether it’s in the media or academic work we talk about after it’s happened,” he said. He noted not enough people realize the effect these countries have had on the development of other countries, mainly in regard to trade and religion. “When you only talk to people you know very well, you start to know what they’re going to say before they say it and they don’t give you any new ideas. When you start talking to strangers who are in the same arena … you start to develop new ideas and innovation begins,” Spooner stated. Iraq was the most socially advanced part of the world for a while. It was the beginning of urban life. Spooner said the climate was changing so rapidly when the Middle East began developing it forced people to grow their own food. However, people began moving toward the water and then developed irrigation engineering. This made it so not everyone had to grown their own food. Spooner continued, “There is no human society without religion.” The Persian Empire in the Middle East developed a dualistic religion. This religion had two divine entities – one total good and one total evil. People who practiced Judaism were interested in this idea and their religion was influenced by this concept. They went from believing in one god to believing there is only one god in total. The Arabs developed Islamic religion in competition with Judaism and Christianity. The Arabs claimed the Islamic religion was the most valid because the Christians and Jews corrupted their scripture. Spooner gave the fourth of five lectures on the Middle East, the final installment being April 26 in Civic Hall in the Connecter Building.